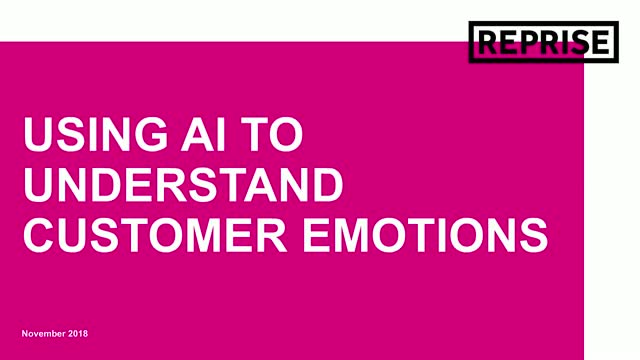 Join our webinar and find out how can you use AI to understand customer emotions. As customer moments become more and more powerful in the search journey, the emotions that your audiences experience can dramatically influence their decision making throughout that journey. This session will discuss how brands can use artificial intelligence to understand the emotions that customers are experiencing and the sentiment of their query, allowing them to deliver much more effective communications. On Wednesday 21st November, award winning teams from digital agencies Reprise, Stickyeyes and Zazzle Media are running a day of webinars to share their insight and learnings from creating world-class digital experiences in 2018. Whether you’re interested in crucial SEO developments and content concepts to ensure you’re front of mind with your customers or, emerging tech or trends to tackle to make sure you can steal a march on your competitors, join any or all of our sessions and take away a list of actionable advice to ensure you hit 2019 running. You’ll only be required to sign up once and every session will be available to view online, either live or on demand. The hub & spoke model has been developed by Zazzle Media as a way for consistently ranking our clients for huge keywords in competitive niches. Using a combination of data analysis, technical improvements and content creation we can capture users attention at any point within their journey. This improves engagement as well as leveraging EAT signals to improve the position of our head terms. Join Tom Smith as he will show you how to research & implement a hub & spoke strategy, what considerations you need to think about, and how to maintain the model once it is launched. Stop treating organic and paid as seperate channels and drive greater efficiencies and increase ROI. Brands are still approaching search marketing as two separate channels, organic and paid, and often engaging separate agencies to work on very different approaches. But in modern search, is this approach really relevant, and is it delivering the best possible return? This session will discuss why an ‘channel agnostic’ approach to search is not only more effective at getting more out of your agencies, but a much more efficient approach to generating a return on your investment. The webinar will look how to push your brand into those all important top spots. We’ll be coaching you on how to audit content effectively to identify weak areas, page structure and improving your internal linking. It aims to prove that your on-page targeting game can influence rankings just as well as backlinks and outreach. What do brands need to do to deliver connected customer experiences that generate a return on investment? Voice search devices are working their way into more homes and more devices, so it has never been more important to understand the voice search ecosystem and the opportunities that they present. This session will discuss how and why voice is emerging as an important communications channels, where voice can go from here, and what you need to do to deliver connected customer experiences that generate a return on investment. Join this webinar and discover what you need to do to step up your content and search marketing strategy. Google’s updated search quality guidelines place a major focus on three key principles; expertise, authority and trust. These updates have changed the game for ecommerce brands when it comes to content, user experience and brand positioning. The update saw a number of established and trusted brands have suffered at the hands of Google’s new policy, so how do ecommerce brands convey expertise, build authority and establish trust whilst, at the same time, producing content that sells? Watch our webinar and follow the 4 stages of lead nurturing to drive more leads and sell more stuff! Lead nurturing is the defining act that turns a lead into a prospect, and a prospect into a sale. Yet is often the part of the process which is most neglected. Perhaps this is why an estimated 79% of leads never convert into a sale, according to MarketingSherpa. -convert those leads into a positive commercial action. Sign up now and take away learnings from real-world businesses to help you nurture your sales leads more effectively and drive more sales. Listen to our webinar and learn how to generate high quality leads that your sales team will love! 85% of B2B marketers say lead generation is their most important content marketing goal but, many brands find it challenging to generate enough inbounds that they can nurture into a more qualified lead and eventually a sale. * CPM (cost per thousand), CPL (cost per lead) or P4P (pay for performance)? Take away learnings from real-world businesses and start building a better pipeline to drive more sales. As marketers we’re increasingly pushed to bring in ever increasing leads and help the sales team nurture these leads thorough a sales funnel to conversion. But how on earth can you make this a reality? We’ve worked with brands in both B2C and B2B spaces, implementing all the major automation platforms so, our webinar will give you an unbiased viewpoint on the path of least resistance and the process steps that will provide you with the most likely success. With over 15 years’ experience in the areas of online marketing and performance based lead generation he leads the lead generation strategy for Stickyeyes and it's clients. Phil has experience working across all major automation platforms ensuring seamless integration between lead generation, marketing and sales teams. He has worked both client and agency side for a range of sectors including public sectors bodies such as European Parliament and European Commission and has extensive experience in the private sector as the Head of Marketing for an enterprise software provider as well as the Director of Marketing for one of the UK’s first online higher education and training providers. Do you work in digital and looking for realistic advice on how to optimise your strategy? Do you manage a large team and want to share practical insight and case studies to inspire and enthuse activity? We started working in digital before Google even existed so we've guided brands through every online challenge imaginable. From SEO to content marketing, biddable media and design and development our monthly webinar series will help you develop, launch and optimise every element of your online strategy.